Welcome to the new online pet portal for Lakeview Veterinary Hospital! From here, you can access everything about your pets care. 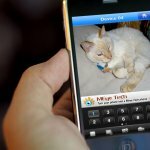 From managing your pet’s upcoming appointments and ordering from our online store to researching your pet’s health, you’ll find it all here. Rapport integrates directly with our hospital’s schedule, which allows you to directly schedule your appointment. Plus, you will receive automated confirmations to your phone or email. No more requesting an available time slot and waiting for a confirmation! Instructions for setting up viewing of Condo Cameras while your pet is boarding with us for PC/Mac or Mobile Device can be found here. For more information on our condo luxury boarding, read our post about it.